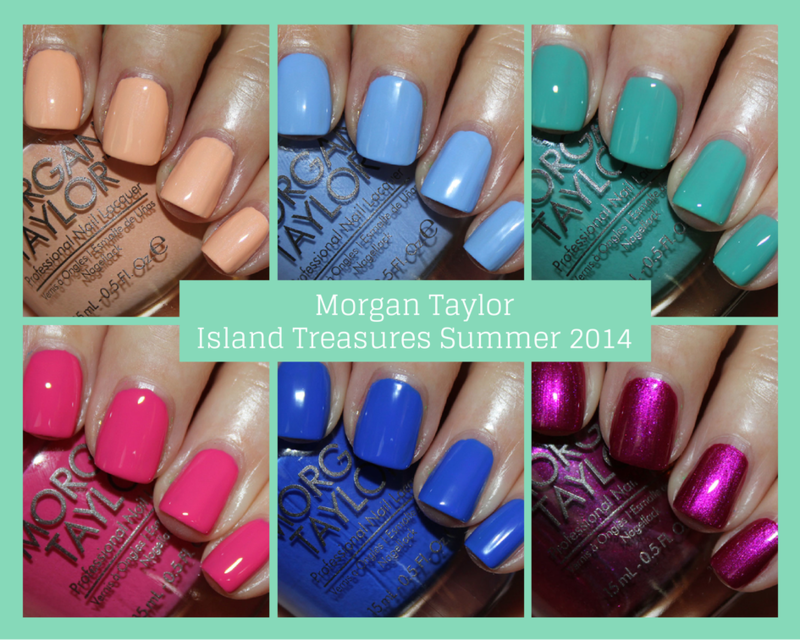 The Morgan Taylor Island Treasures Summer 2014 collection was inspired by the natural palettes of the tropics: blue skies, turquoise seas and vibrant sunsets. This isn’t what one might normally think of when they think of a summer collection, but I kind of like the direction they took it. The formula with most of these was just excellent and most were two coats. This limited edition collection is available now at beauty stores and salons and the Morgan Taylor website for $8.50 each. Beach Babe is a light peach with subtle shimmer. In fact, I wasn’t even aware this had shimmer until I saw the photos, that’s how subtle it is. But the color is pretty unique. It made my hands look quite tan! This was two coats. Take Me To Your Tribe is a periwinkle creme. Utterly beautiful and mesmerizing. This was two coats. Going Native is a turquoise green creme. This one had a much thinner formula, almost watery, so it required three thin coats. It is a wee-bit more uneven than the rest of the shades in this collection. Gorgeous shade though. Tropical Punch is a bright pink fruity creme. Pretty pink, very saturated and just two coats. Making Waves is an intense cobalt blue. STUNNING. MUST-HAVE. This is truly an excellent color with an excellent formula. Get this one if you don’t already have it! Sarong but So Right is a shimmery magenta. This is a really beautiful shade. It reminds me of something you would see in the fall because it’s very jewel-toned. This had a great formula and was just two coats. Fabulous collection! I am completely enamored with Take Me To Your Tribe and Making Waves, especially! Which ones are you coveting now?